One aspect of software piracy that’s always interested me is the way protection schemes always seem to end up causing nothing but trouble for legitimate users — while pirates happily release 0-day cracks to use the software trouble-tree (albeit illegally). The issue’s been around since at least the early 1980s, and continues to spread into other forms of IP, like DRM. This has all been discussed endlessly elsewhere. I’ve rarely hit the Google SafeBrowsing (malware) warning page, but last week it flagged a few sites that caught my attention. One was example.com (a reserved domain, which amusingly caused our test suite to fail :). The others were real web sites, both for popular Firefox extensions — joehewitt.com and downthemall.net. 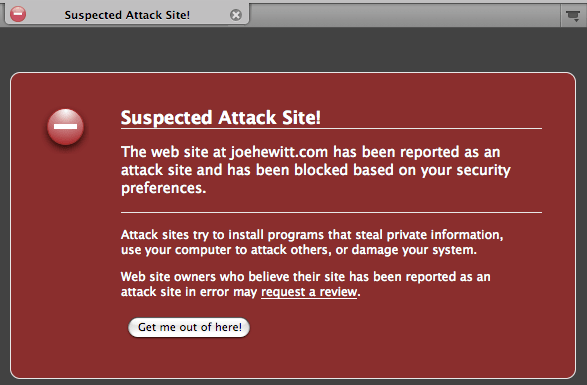 Blocking the user when they’re familiar with the site (and expect it to be safe) is rather annoying. Doubly so because there’s no obvious way to bypass it (other than disabling the feature entirely in the preferences). There’s some discussion on this point in bug 400731, and I think there’s a strong argument to be made for *not* having an easy bypass. So, uhh, completely not helpful. As a user, I’m now inclined to believe that it’s just some kind of screwup, and now I’m grumpy at Firefox and Google. Why exactly is the site “bad”? What guideline(s) does it violate? What’s going to happen if I visit it anyway? Is the whole site bad, or just part of it? Does it have a history of problems? Might it just be a recent hack? If I was there last week, should I worry that it did something bad before the block started? Has the report been verified/confirmed, perhaps by a Real Human? When was it last checked? There’s this Netscape page for a 1995 (?) animation contest (holy 16-color flashback, batman! ), which conveniently has images for each frame for the winner and top 5 entries… APNG time! There was also a second contest in 1999, but I can’t find the entries anywhere online… These two throbbers are in the old Mozilla 1.7 tree, perhaps they were the winners? As you might have heard, the theme for Firefox 3 has been undergoing a refresh. Alex Faaborg has been blogging about most of the big changes, but I thought I’d mention one little piece of remaining work — the throbber — and see what other ideas people had. I know we have an amazingly creative Mozilla community, so I’m curious to see about shaking out some other great ideas for a new throbber. If you’re feeling creative, grab APNG Edit, do a mockup (talk is cheap! ), and attach it over in bug 326817. No unhelpful kvetching, please.